Edward George Robinson, son of Edward Robinson and Emma Waldren, was born on June 19, 1923, in Albany, New York. He was baptized on July 1, 1923 in the church of St. James in Albany. After his public grade school education he entered the Vincentian Institute in Albany, where he completed a four year high school curriculum. In September, 1941, he began a first year college course as a postulant at Augustinian Academy, Staten Island, New York. On September 9, 1942, Edward was accepted into the novitiate, professed first vows on September 10, 1943, and made his solemn profession on September 10, 1946. In June, 1946, he received his B.A. degree from Villanova College, Villanova, Pa. From 1946 to 1950, he studied theology at Augustinian College, Washington, D.C., and, at Catholic University, he also completed courses, wrote a dissertation and received credits for an M.A. in Latin and Greek. On June 11, 1949, he was ordained to the priesthood by Most Rev. Edmund F. Gibbons, Bishop of the diocese of Albany, New York, in the Cathedral of the Immaculate Conception, in Albany. 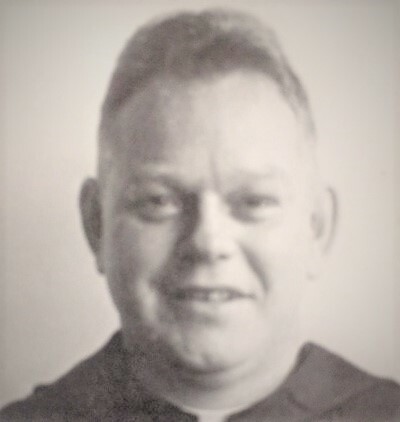 In the Fall of 1950, Father Robinson received his first assignment to St. Thomas High School in Rockford, Illinois, where he taught courses in General Science, and served as disciplinarian for two years. In November, 1952, as a member of the Chicago Province, he became a missionary to Japan, where he served a total of eighteen years. On November 11, 1952, he was assigned to Nagasaki, and in March, 1958, he became pastor in the parish at Hatano. In 1970, Father Robinson returned to the United States, was affiliated to the Province of St. Thomas of Villanova, and was assigned to St. Augustine Parish in Troy, New York, where he was able to assist his father who was ill. Two years later he returned to Japan for a short time and then accepted an assignment to the parish of St. Thomas Aquinas, Ojai, California. In 1973, he returned to St. Augustine Parish in Troy, where he served as an assistant until September 1, 1973, at which time he was appointed Pastor and Prior at St. Augustine Parish in Andover, Massachusetts. His last assignment was to Lawrence, Ma., where he became an associate pastor at St. Augustine Parish. Father Robinson possessed a great desire and ability to entertain guests. He cherished the memories of those who knew him by maintaining photo albums filled with hundreds of pictures of relatives, parishioners, friends and visitors. A friar who was a good friend of Father "Rusty," as he was widely known, wrote, "One of Rusty's greatest qualities was his compassion, a deep sensitivity for people, especially for those who were suffering or were disadvantaged in any way. Rusty had a heart as big as himself; he was open and friendly to everyone, and was very generous. He trusted people, and for that reason he was an easy mark for anyone with a hard luck story." On May 26, 1980, Father Robinson died by drowning while swimming at Rye Beach, New Hampshire. The Mass of Christian Burial was celebrated in the Chapel of Christ the Teacher, Merrimack College, No. Andover, Ma. A second liturgy was celebrated at St. Augustine Church, Troy, New York, followed by interment at St. John Cemetery in Troy. Newer Post Thomas J. Rodgers, O.S.A. Older Post Frederick S. Riordan, O.S.A.